Paint can hide a multitude of decorating sins—chips, scrapes, and ugly or outdated colors can be all but forgotten under a fresh coat, giving your pieces a brand-new life. And it can help you achieve uniformity in your decor, which is great when you’re arranging a new place, especially if you’re merging two furniture collections. If you want to avoid peeling or chipping paint, however, you’ll need to take your time and do the job right. Skip or skimp on one of the following steps below and you could be right back where you started from in a few months. 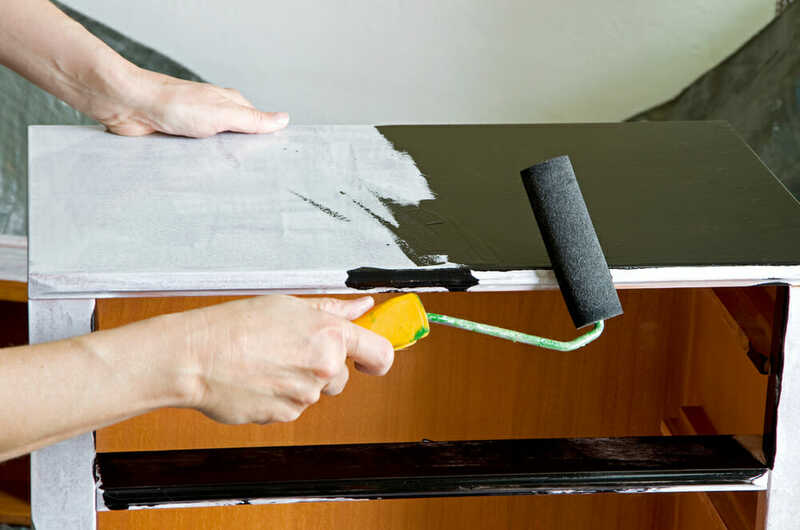 Here’s a hitch-free tutorial on repainting so you can put that ugly or dinged-up furniture far behind you and begin your new life as a homeowner. Even if your furniture looks clean to the naked eye, it’s never a bad idea to give it a wash before you get rolling—you never know what kind of residue or gunk might reveal itself upon closer inspection. Use gentle dish soap or vinegar and water, and pay special attention to frequently handled areas, like drawer pulls and knobs. Wood surfaces need to be sanded in order to absorb paint. For most furniture, use 150-grit sandpaper, sanding either by hand or with an orbital power sander. If the piece is covered with varnish, however, trade that out for some 80-grit sandpaper. Make sure to manually sand round or decorated surfaces. 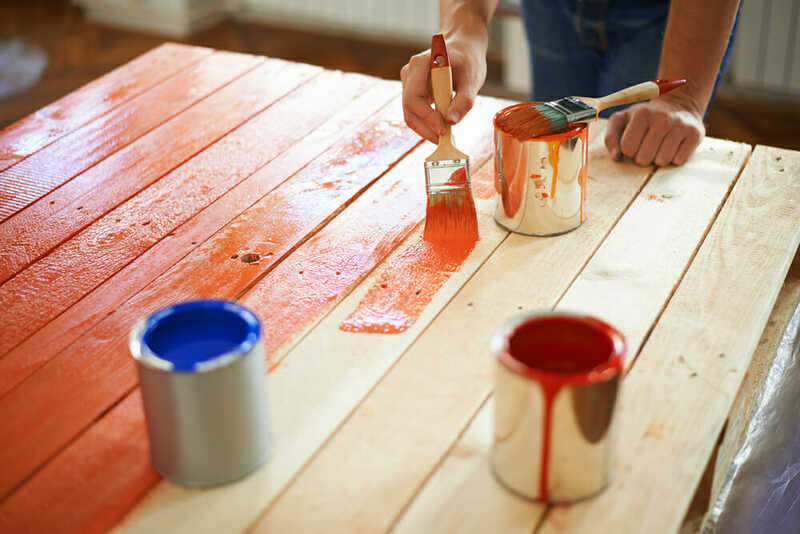 You don’t have to completely strip the surface—you’re trying to rough up the paint or stain so that it can take the primer, not completely obliterate any trace of it. Don’t listen to any advice that tells you don’t need to use primer. This pre-paint coat is the best way to ensure that your paint properly adheres to the surface. Before getting out the primer and brushes, however, give your piece a quick wipedown with a lint-free rag to take care of any flecks of paint or wood that might remain. Also remove any knobs, handles, or drawers and work on these separately. Use a satin or semi gloss oil-based or latex primer, but take care that the gloss and type are matched to the paint you chose—for instance, use only oil-based primer for oil-based paints. Oil-based paints and primers give off fumes, so make sure to provide adequate ventilation. Use a narrow brush and apply the paint with the grain of the wood, taking care not to allow any drips or runs to form. Let the primed piece dry overnight. If you previously used 80-grit sandpaper, switch to 150-grit for your second sanding. Using a very light touch, graze the piece with the sandpaper, paying particular attention to any drips or raised areas. Once you finish, again, brush away any residue using a rag. Starting from the top of the piece, work down, applying the paint in smooth, drip-free strokes that go with the grain of the wood. Again, oil-based or latex paint in a satin or semi gloss finish is best. Apply a full coat of paint and allow it to dry for six to eight hours. Then reapply a second or even third coat—the more coats of paint, the stronger the finish, so make sure to put on at least two. Once you are happy with your paint’s look, allow it to dry fully for at least 24 hours, and then apply a thin coat of either a clear finishing wax using a clean cloth, or spray it with a polycrylic sealer from a can. This will finish your piece and protect it from cracks and chips. You may have noticed that these instructions have applied only to wood pieces. 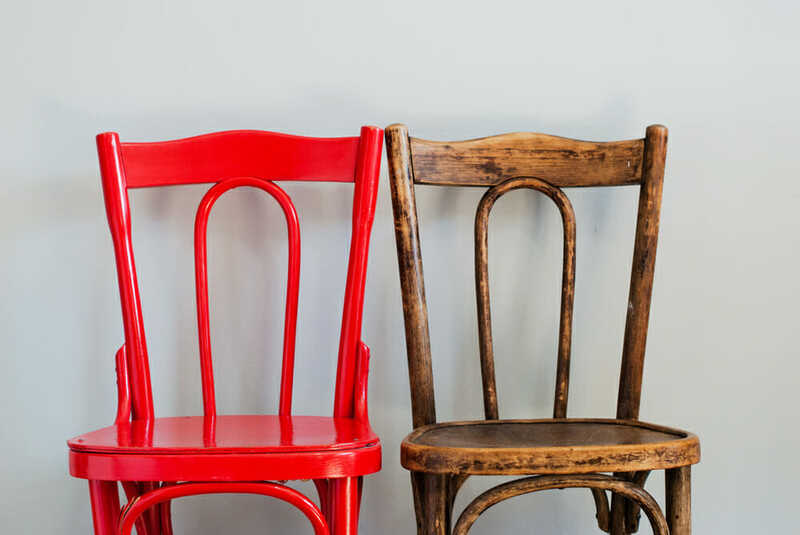 You may be wondering if you can repaint metal furniture—the answer is yes, but you’ll need to use a slightly different process. To paint metal pieces, use a wire brush to scrape away any chipping paint or rust spots, then run over the piece with a sanding block. Wipe the furniture down and spray the piece with a primer that’s rated for metal surfaces. Then spray with metal-friendly paint in a light coat. Let dry, then apply a second coat. Voilà—a brand-new look for just a few bucks!